Computer pioneer and mathematician Grace Murray Hopper is best known for her 1952 invention of Flow-Matic, the first compiler — software that translates instructions written in English into machine language for the target computer. Compilers have allowed the development of computers that seem to "understand" English, a breakthrough which lets computers be programmed by people who might lack an advanced degree in mathematics. Hopper worked on several first-generation computers, including the Mark I, Mark II, and Mark III. She helped John Presper Eckert and John William Mauchly with the design and development of the BINAC (Binary Automatic Computer), and she was involved with programming the UNIVAC I, the first U.S. commercial electronic computer. In 1959 she wrote the original specifications for the COBOL (COmmon Business-Oriented Language) programming language, which formed the basis of software design for the next generation of computers. She was the first winner of the Data Processing Management Association's Man of the Year Award, in 1969. As a girl she disassembled and reassembled the alarm clocks in her family's home, and as a young woman she studied under Øystein Ore at Yale. She joined the Navy WAVES (Women Accepted for Voluntary Emergency Service) in 1943, and was assigned to work under Howard Aiken at Harvard's Bureau of Ordnance Computation Project, where she became an expert at the heavy mathematics then required for programming, and literally wrote the operating manual. Her first major innovation was to catalog and share common portions of different programs, to avoid "reinventing the wheel" with every piece of software. She frequently encouraged co-workers and subordinates to think beyond the bounds of the ordinary, and to illustrate the point she kept a clock in her office that ran counter-clockwise. According to a tale often told by Hopper, the term "computer bug" was inspired by a 1947 incident at the Harvard lab, where bugs — meaning, insects — had been suspected as the cause of a recurring malfunction. A technician found and killed a moth at relay #70, panel F, deep inside the room-sized Mark I computer, and Hopper taped the dead bug to the lab's log, with the notation, "First actual case of bug being found." She retired from the US Navy three times — first in 1946, switching to the Naval Reserve; then in 1966 with the rank of Commander, but within a year Navy brass asked her to return, to help develop an automated payroll system. She was promoted to captain in 1973, and retired for the third time in 1986 with the rank of rear admiral. She died in 1992, and was buried with military honors at Arlington National Cemetery. 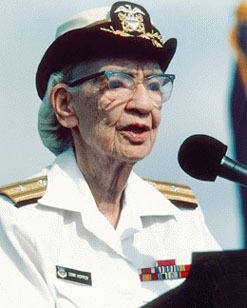 She is the namesake of the Navy destroyer USS Hopper, and the Hopper Award, presented annually by the Association for Computing Machinery. Her brother, Roger F. Murray, was an economist who devised and proposed the concept of the individual retirement account.